I have this tendency, when I photograph, to not want to force anything. I’ll be doing something with a friend or on a hike and I will see the image in my head; I will see the moment as an image. So, when I photograph, I end up taking images of moments that are happening and not going out with the specific intent to take images, which has a very polarizing effect for the people viewing my images. 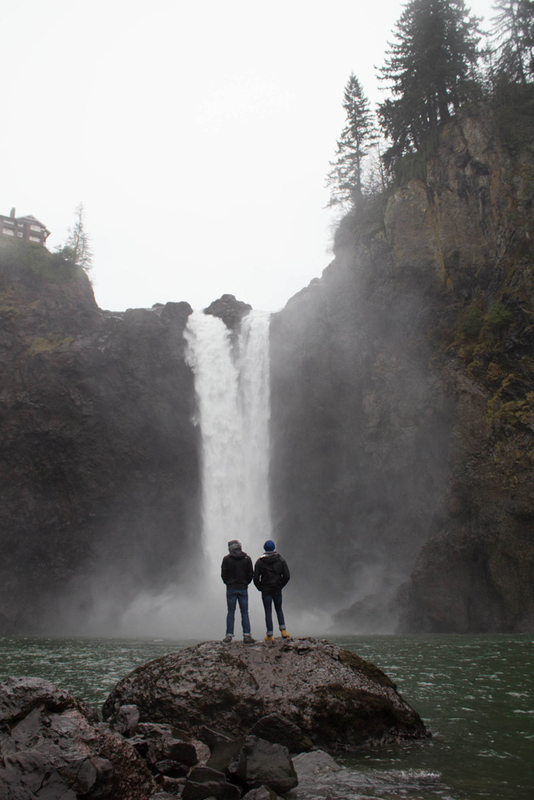 In the instance of this image, entitled “Packaged Deale,” I was hiking with my brothers, Ryan and Adam Deale, in the Seattle area, Snowqualmie Falls to be specific, when I turned back around to say something to them and I saw that the way waterfall was representative of them and how the surroundings were framing them. I told them to stop and since they happen to be willing to model for me, for which I am very grateful, they did and I captured this image of them in front of this waterfall, which they now have hanging in their apartment. However, even though I took this image in a moment of inspiration does not mean that I do not have something to say with the image in mind as I’m taking it. I saw this waterfall, with one side being slightly larger and more forceful than the other before they join into one pool, and I immediately thought that it was representative of my brothers and of the people in our society as a whole. While one of my brothers is more forceful and larger than the other, they still end up coming together and joining in the ‘pool of friendship’ as I’m calling it (cheesy, I know, but you get the idea), or (as a less cheesy option), you could say that they’re a packaged deal(e). Despite the fact that some people in this world are more forceful and stronger, it doesn’t mean that we aren’t all humans and that we all can’t come together to create a movement or create a community that supports all life (like a river, get it?). Anyway, now I’m sure you’re wondering about the logistics of this particular image! I took this image on a Canon Rebel T3i with an 18-55mm kit lens. My ISO was 400 to capture the speed of the waterfall, my aperture was at f/4.5 with a shutter speed of 1/60 of a second. I am using a shallower depth of field so that my brothers would be the main focus while allowing the waterfall to fade into the background and not take up the majority of the focus in the image. This image really makes me realize the beauty of our world and how we are all similar despite our insistence otherwise. I hope this image is making you stop and think about our world in a new way or that it is a reminder that we are all human. My name is Stevie Deale. I have grown up in California, but in the last two years, I have worked in various places, such as Flagstaff, Arizona, multiple locations in California, England and Madrid, Spain. I have studied photography since I was 13 and I still enjoy the practice of taking images. I take self-portraits and I explore the intricacies of the human experience through my work. My goal is to capture the unexpected and simple moments in life, such as a person in a coffee shop, or out in nature, just enjoying life.